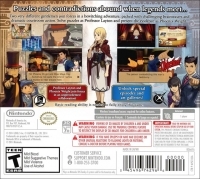 • Professor Layton and Phoenix Wright join forces in an unprecedented collaboration! • Unlock special episodes and art galleries! 02-10-2016 silverbow Box Text Puzzles and contradictions abound when legends meet… Two very different gentlemen join forces in a bewitching adventure, packed with challenging brainteasers and dramatic courtroom action. 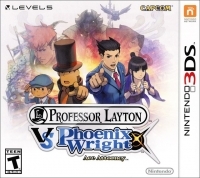 Solve puzzles as Professor Layton and present the evidence as Phoenix Wright… • Professor Layton and Phoenix Wright join forces in an unprecedented collaboration! • Unlock special episodes and art galleries! This is a list of VGCollect users who have Professor Layton VS Phoenix Wright: Ace Attorney in their Collection. This is a list of VGCollect users who have Professor Layton VS Phoenix Wright: Ace Attorney in their Sell List. This is a list of VGCollect users who have Professor Layton VS Phoenix Wright: Ace Attorney in their Wish List.